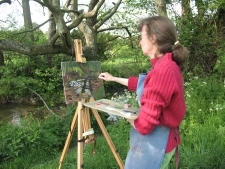 One to One Drawing and Painting lessons in a relaxed and friendly studio. They are run on a pay as you go format. The day and times may vary to suit each of our needs. Should you like to come as a couple or with a friend I am happy to tutor you both. The aim of the lessons is to provide you with the skills to draw and paint. I encourage you to work from life, either in the studio or outside. By setting up objects and working directly from the subject I can help you to draw, see and mix colour and learn the basics of oil painting. Most beginners find it difficult to know where to start, I will show you. This is not a quick fix. As with most things, the more you practice the better you get. I also visit art groups to give tuition and demonstrations. Telephone or e-mail me for further infomation. Details on the contact page of this website.